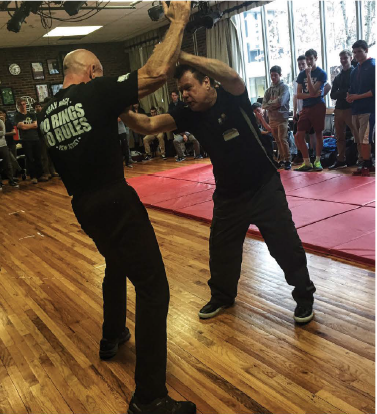 What is Krav Maga, and what are the key principles on which the system is built? Let’s begin with a simple definition: Krav Maga is a Hebrew phrase that means “contact combat.” Clearly, this encompasses many elements. For the purposes of this article, we will focus on dealing with attackers. A key concept to bear in mind in dealing with attackers is this: It’s not your fault, but it is your responsibility. In other words, while you did not go looking for a dangerous situation, you found one anyway – and you are the one who must now take responsibility for getting out of it safely. There are various ways to deal with attackers. On the other end of the spectrum, it is possible to “win” a fight without ever engaging in direct combat. Remember: A physical confrontation can result in a wide range of unintended consequences, including jail time, civil suits and costly hospital stays. Prevention, avoidance and de-escalation are three possible ways to emerge unscathed from an attack. For instance, creating physical distance between yourself and the attacker can be an effective way to avoid harm. There may be times, however, when a physical confrontation is unavoidable. To prepare for such an eventuality, it is suggested that you enhance your abilities through Krav Maga. This entails training yourself mentally, physically, technically and tactically. Effective and powerful verbal communication is also essential in dealing with attackers. Words like “no” and “don’t” mean little in a confrontation. On the other hand, decisive language, delivered in a commanding tone, has been known to stop potential conflicts before they turn physical. Your mental capabilities are as important as your physical ones. The key to a winning mindset is to recognize that you must do the job; no one else will do it for you. Along with this attitude of personal responsibility comes determination, aggression and courage, all of which are essential to success. Maintaining a calm mind and keeping your emotions under control will also aid you significantly. 1) Be aware. Stay tuned in to what’s going on around you, and be prepared to respond appropriately. 2) Be knowledgeable and experienced. The best way to equip yourself to deal with attackers is through aggressive, ongoing training. 3) Be conditioned. Strengthening your body and building stamina through regular, high-intensity workouts can make a huge difference in a physical confrontation.